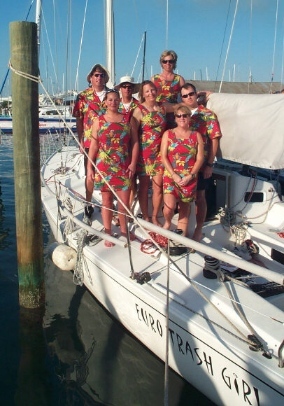 Team APS is gearing up for Charleston Race Week! Six of our staff members will be reporting to dock call on Friday morning. It will be my first time racing in Charleston and also my first time driving a trailer with a boat that is more than 16 feet long…yikes! We won’t be stopping at too many drive-thrus. Aaron Freeman in Customer Service and I will be crewing on J/80s. From what I hear, we will be racing on the inshore course – which means a later dock call, more time to hit the snooze button, and another hour we can stay out late at the bars. This year’s Race Week has a whopping 279 boats registered with a 40% increase from last year’s attendance, qualifying the regatta as the largest in the country. In fact, when the registration topped at 270 boats, the regatta chair realized that they had no space for that many competitors and thus added a fifth course. The inshore course alone has 200 boats registered. It’s going to be a chicken race to the starting line, and hopefully, with the addition of another course, there will be less chance of a snafu. The fleet of 80s will consist of 26 boats – a pretty large fleet to race in – and many of the 80s are Annapolitans. We had some team gear made for our boat. I was hoping for additional team gear for the after party similar to the sun dresses that were custom coordinated for the J120 Eurotrash Girl, but I was ruled out. Maybe next year, we’ll have more motivation for wearing ridculously coordinated clothes. I would have to say everyone from APS who is headed South for race week is incredibly stoked! It’s going to be an amazing time with warmer weather for a change. Look for a full Charleston report in the coming week!